6 Bed 5.5 Bath room has 6,000 Sqft Game Room, Pool, Jacuzzi, Out Door Kitchen. Things have returned back to normal So, we are accepting regular tourists again. Most tour companies have reopened at reduced rates the islands beaches are also swimmable and clean again. This Property has a 5-star rating for the last 2 years both for the facility and service to clients. The property remains completely intact since the hurricane and the pictures are highly representative of the property today with the exception of the loss of 3 palm trees. The house is outfitted with a 28kw Cummins Generator and a 2000 -gallon cistern. So, it is fully functionable and operating. It’s located 7 miles from the San Juan Airport with easy access to highways going north, south, east, and West. This Property is ideal for Contractors and Agencies working in the Recovery of Puerto Rico. This two-story estate is owned and operated by the CEO of a large restaurant chain. IT has 6,000 Sq. ft., 6 bedrooms, 5.5 Bath rooms, a Hotel Size Pool, 10+ Jacuzzi. The Swimming area is surrounded by a replica of the fort located in Old San Juan. The back-pool area also has a coke room outfitted with a bar, TV, stereo, pool table and working soda fountain included in the rent. We will provide dish/tv in both the family tv room and the coke room. There is a large car port for 8 cars with additional parking in the street. The property is Located in “La Cima”, the most exclusive section of Encantada a Luxury Triple-Gated Community in the town of Trujillo Alto. Fuel availability can be provided at the house upon request as well as a cook or chef. So, meals are available upon return from the field. The price is 1200 per night and 260 weekly for 2 cleanings per week. The maid service includes drying and folding of clothes. Any additional specific needs in most cases can be accommodated. You will be very pleased if you choose to stay with us. Every room has a/c.You can use them while at thge house but if you leave you must turn them off or you might lose the deposit. Free and has space for 5 cars. You must rent a car if your staying at this house. DO NOT PASS THIS PROPERTY BY! Kevin is absolutely wonderful to work with and assist in any way that he can. He was always quick to respond and provide information about the area. He also set us up with his cousin Felipe for a GREAT catered meal one evening. The view of this place is absolutely awesome and the service provided by Kevin, makes it 1000% top notch. Even had a chance to meet the owner and what a great guy! This is a must stay place! The house was as advertised including the backyard with the pool. We spent the majority of our time in the room with the pool table or outside which was excellent. The property and house manager were both excellent in answering any questions and providing us information and where to visit and eat. Our overall experience was excellent and would certainly rent it again. Awesome place, comfortable beds, fun pool. This is an awesome spot, super comfortable, lots of space for a family to spread out in. Kevin got us there, showed us the place, and gave us tons of recommendations on what to do and where to eat. He did this for us our entire stay, we asked him tons of questions, and he never acted putout, he always helped us out. The kids played for hours in the pool and we were lucky enough to stay here on New Years Eve. We sat on the balcony and watched what seemed like all of Puerto Rico light off amazing fireworks, one of the best displays we've ever seen. We spent a lot of time at the beaches, so it is a bit of a drive, but this house is completely worth it. This House is in great condition considering it survived a major Hurricane. This was on of our primary concerns. The rooms are huge all bedrooms have walk in closets. The views can only truly be appreciated in person. We felt safe, welcomed and comfortable. Kevin, the property manager, was always available to answer any questions throughout our stay. The location is perfect happy medium between the city sights and adventure spots like the rain-forest. Can't wait to come back and stay here again. We have worked tirelessly since the Hurricane to bring the property to Pre-Maria standards and better. It makes us rejoice when it reflects in our clients happiness. Our scheduled stay, unfortunately, has been postponed due to the tragedy of Hurricane Maria but we hope to reschedule another trip to Puerto Rico soon. We cannot thank Kevin Rodriguez enough for responding promptly to all of our emails and phone calls following the storm, and for graciously refunding our $500 security deposit when the decision was made to postpone our trip. Throughout the process, Kevin answered all of our questions honestly and completely. We could not have been more pleased with his superior customer service skills! Property is beautiful, Fun and Inviting! 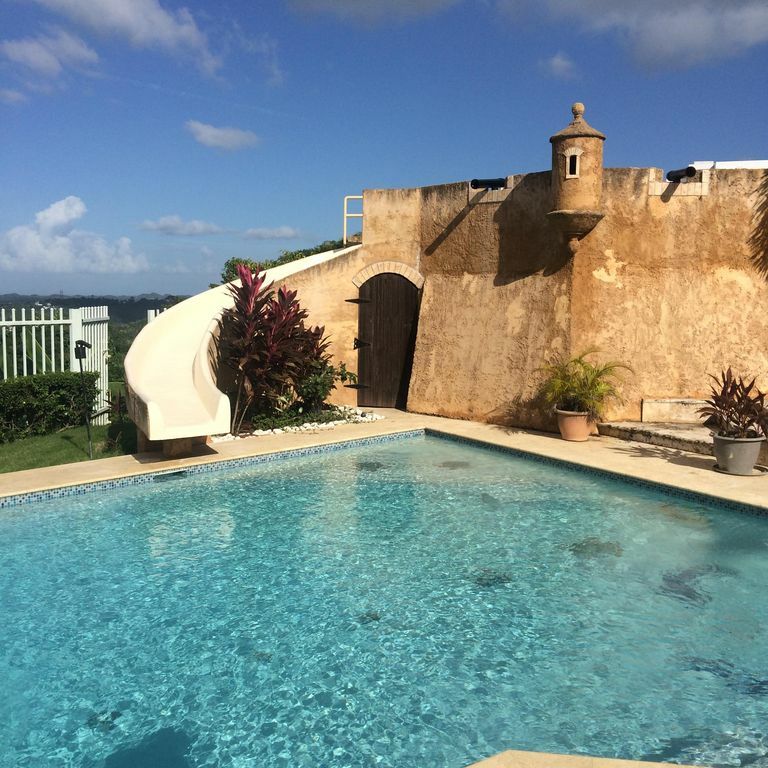 The property is located in Encantada a Super Exclusive Luxury neighborhood in Puerto Rico. It has 24 hours triple gated security and is short 20 minutes from San Juan and all its beaches and hotels.